There’s nothing like fresh basil. Pesto is traditionally made in a mortar and pestle but the food processor’s convenience has taken over. Apart from using pesto in its traditional role as a pasta sauce, spread it on sandwiches, spoon it over a baked potato, grilled fish, or chicken. Add a dollop of it on soup right before serving. Toss it with steamed or grilled vegetables.Substitute almonds for the pine nuts, use parsley instead of basil… create your own signature pesto. * add a bit of pasta water when adding to pasta. 1. 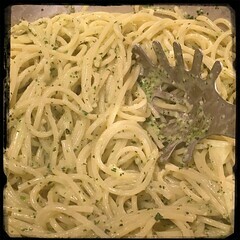 Put the garlic, basil, parsley, pine nuts, and salt into the food processor. 2. While mixing add the cheeses and continue to combine together until a nice consistency is achieved. 3. Add the olive oil slowly, blending it into the pesto evenly. 1. Put the garlic, basil, parsley, pine nuts, and salt into the mortar. Using the pestle, grind into a paste. 2. When the consistency of the paste is fairly even, add the cheeses and continue to grind them together. 1. Add one cup of pasta water when mixing with the pasta, .